Satoshi and Pikachu head to the Alola Region...to attend school!? "Alola! The First Island and the First Pokemon!!" "Enter the Guardian Deity Kapu Kokeko! Let's Try Out Our Z-Move!!" "Enter Mokuroh! I Got a Pokemon in Alola!!" "That's Why Litten is a Scamp!" "Who's Gonna Be in Charge of the Egg?" "Try It Out in Real Life! Gather at the Pokemon School!!" "The Totem Pokemon is Dekagoos!" "Will the Z Move Work! Face the Grand Trial!!" "Satoshi Goes to Kaki's House!" "Our Extracurricular Class is Hidoide!?" "The Great Alola Pancake Race!" "The Proof of Her Courage, Lillie and Rokon!" "Scratchmark Hill, Iwanko and Lugalgan!!" "The Small Trio's Big Adventure!!" "They Might Not Be Giants!" "Alola's Detective Rotom! The Mystery of the Lost Crystal!!" "Are You For Real!? Mao's Great Cooking Operation!!" "Intense Electric Training! A Rematch with Kapu Kokeko!!" "It's the Exact 20th Anniversary of the Pokemon Animated Series! The "Gather at the Pokemon House?" 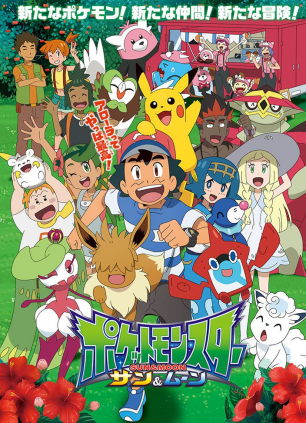 Special"
"The Promise Between Satoshi and Pikachu"
"It's Time for Nyabby to Set Off!" "How Shocking! The Dugtrio Splits Up!?" "Alola! The First Open Campus!!" "The Struggle for the Crystal! The Rocket-Dan vs. The Skul-Dan!!!" "Come Forth! Lugalgan's Crimson Gaze!!" "The Fiercly Fought PokeBase! Go for the Homerun That'll Turn Things Around!!" "Will You Dream-ush in Nemush's Forest Too?" "Lillie, Take Good Care of Pikachu, OK?" "The Ol' Raise and Switch!" "Enter Lychee! The Laughing, Crying Island Queen!!" "The Flashy Yowashi is Totem of the Marshy!" "Pocket Monsters The Movie "I Choose You!" "A Flaming Battle! A Garagara Appears!!" "A Crowning Moment of Truth!" "A Curry-zy Beautiful Battle! Lalantis' Dance!!" "Lychee's Grand Trial! The Number One Hardest Pokemon Match!!" "Iwanko and the Guardian Diety of the Ruins of Life!!" "Mao the Runaway and Yaregutan"
"Ashimari, Oshamari, and the Anchor-y Dadarin!" "An Alola! in Kanto! Takeshi and Kasumi!!" "Gym Battle! Z Move vs. Mega Evolution!!" "Satoshi and Hoshigumo! A Mysterious Meeting!" "Hoshigumo Panic! A Sudden Teleport!!" "Now You See Them, Now You Don't!" "We're Searching for the Transformed Metamon!" "Glazio and Silvadi! The Limiter Mask!!" "Strike a Full Powered Pose for the Sleepover!" 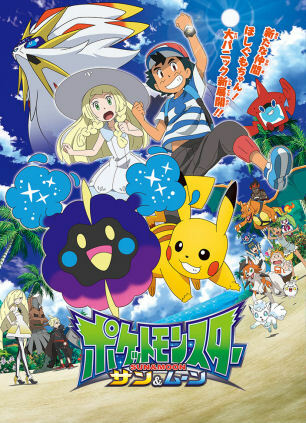 "Lillie, Silvadi, and the Resurrected Memories"
"Sauboh Strikes Back! Hoshigumo is Kidnapped!!" "Real-Lillie Give it Your All! The Decision to Leave Home!!" "The Altar of the Sun! The Advent of Solgaleo!!" "Shine Bright, Z-Power Ring! The Super Full-Powered 10 Million Volts!!" "Thank you Solgaleo! You Are Our Hoshigumo!!" "Sleep Makes a Child Strong: The Secret of Nekkoala!" "The Dex Can't Help It!" "Mao and Suiren, Bittersweet Memories!" "Lillie's Flying! The PokeSled Jump Conference!!" "Mobilize! You're Our Ultra Guardians!" "The Evil Nyarth is an Alolan Nyarth!?" "Get Fired Up Nyabby! Down with Gaogaen!!" "Satoshi and Nagetsukesaru! A Touchdown of Friendship!!" "Ilima and Eevee, I'd LIke to MAke an Appearance!!" "Use Sketch to Smash It! The Fiercely Fought Poke Ping Pong!" "I Love Shiny Things! The Spinning Bevenom!!" "On-the-Job Experience! Twenty-Four Hours at the Pokemon Center!!" "Protect the Farm! The Blue Flame Counterattack!!" "Ta-Dough~! Get Fired Up, Mao's Family!!" "The Rocket-Dan's Island Challenge!? Get a Z-Ring!!" "The Tough Old Geezer's an Island King!?" "Kapu-Bulul! The Slacker's "Ugh, Fine" Training!!" "The Decisive Supermarket Battle! Pikachu vs. Mimikyu!!" "Kuchinashi's Grand Trial! The Awakening of Lugalgan!!" "The Ultra Beasts Collide! The Great Boom-Boom Crackle-Crackle Operation!!" "Meteno and Bevenom! A Promise Lost in the Starry Sky!" "Showering the World with Love!" "Sand's Storm! The Double Battle in the Ice Cave!!" "The Young Flame of Alola! The Birth of Royal Satoshi!!" 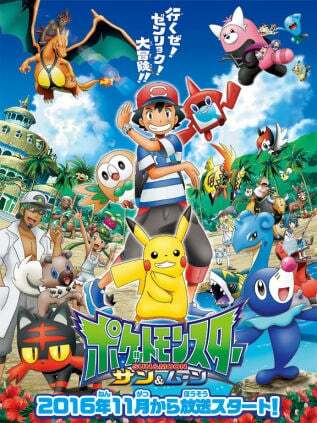 "Pocket Monsters The Movie "Everyone's Story"
"Pokémon The Movie: The Power of Us"
"Won't You Resolve to Evolve with a Little Dance Dance?" "All They Want to Do is Dance Dance!" "The Meanings of Family, the Feelings of Bevenom!" "I Choose Here! The Pokemon Steam Paradise!!" "Crisis in Alola! The Darkness that Swallows the Light!!" "Lunaala vs. UB: Black! The Battle of the Full Moon!!" "A Prism of Light and Darkness: Its Name is Necrozma!" "Connect to the Future! The Legend of the Radiant One!" "A CHU~ge Outbreak! The Pikachu Valley!!" "Kukui's on the Ropes! There's a Second Royal Mask!!" "The Hero Lilliel and the Staff of Alola!" "A Gathering of Ghost Pokemon! Everyone's Haunted House!!" "A Haunted House for Everyone!" "Wela Volcano: The Golone, Golonya, and the Hiker!" "Don't Ignore the Small Stufful!" "Fukuthrow the Master!! Mokuroh the *Yawn* Napper"
"The Duo Splits Up!? Satoshi and Rotom"
"Where is Eevee Going? It'll Go Anywhere to Meet You-Know-Who!" "The Lightning that Stalls the Wind! Its Name is Zeraora!!" "Let It Loose! The Twin Sparking Gigavolt of Friendship!!" "An "Alola!" in Alola! Takeshi and Kasumi!" "A Passionate Heart That Smashes Even Rocks! Lychee and Takeshi!!" "Heart of Fire! Heart of Stone!" "The Poni Island Research Project! Search for the Island King!!" "That's Some Spicy Island Research!" "The Decisive Battle with Lugalgan! Satoshi vs. Glazio!!" "For Every Valley There Will Be...an Ocean!? The Great Pokemon Evolution Special Training!!" "In the Mists of Kapu-Rehire"
"The Birth of the Island Queen! Satoshi's Grand Trial!!" "They've Come to Alola! The Melty Metal Panic!!" "We've Spotted a New Species! Get Meltan!!" "A New Show!? Sealed With a Loving Koiking"
"Guzma, the Emperor of Destruction!" "Lillie and the Secret Tricky Princess!" "Shaymin, Meltan, & Nagisa! The Lost Pokemon's Expedition Party!!" "Aim for the Top Floor! The Roaring Dragon Gym!!" "Suiren Reels in a Kyogre!?" 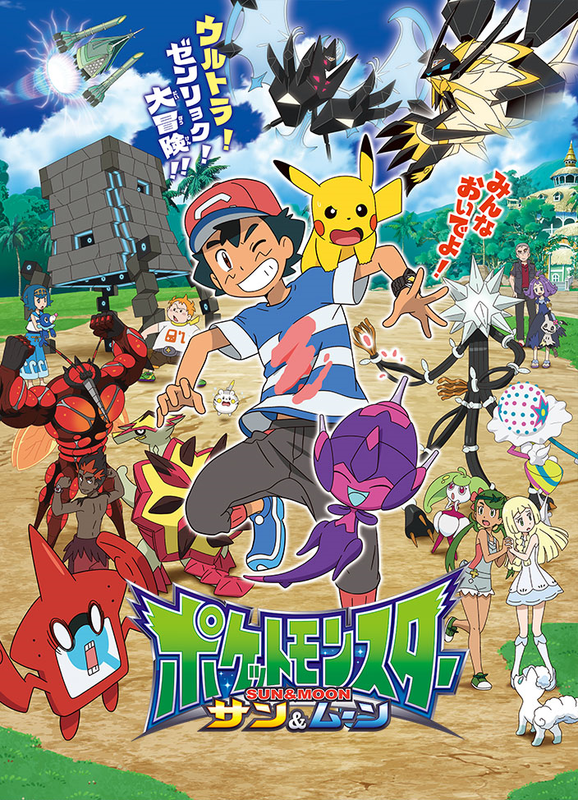 1 In the Japanese version of both the games and the TV series, the Rotom Bestiary sprinkles the word "roto" into its speech the same way the Rocket trio's Nyarth sprinkles "nyaa" into his speech. 2 The Japanese title contains a play on words; the words "ganbaru" ("do your best") and "balloon" are combined to make ganballoon. 3 The Japanese title seems to be a play on the title of the third Best Wishes! movie, The Extreme Speed Genosect and the Awakening of Mewtwo.